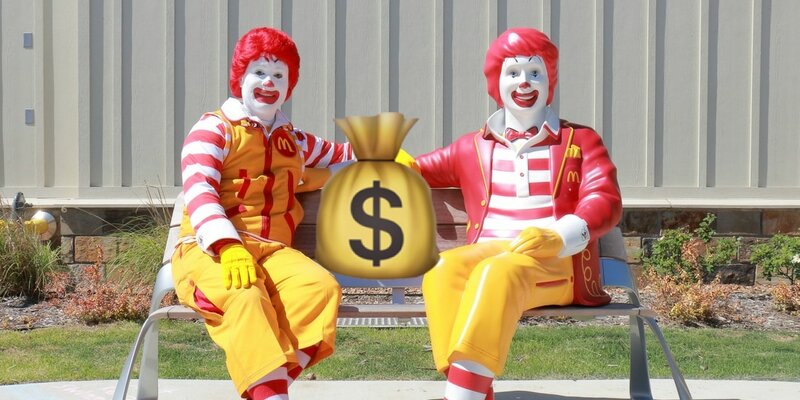 Ronald McDonald might be your next boss. The multi-billion dollar behemoth behind the Golden Arches just acquired Dynamic Yield for $300M+, signaling their willingness to acquire companies wayyyy outside of their comfort zone. Big Macs mean Big Money and Big Data. Dynamic Yield helps companies sell more products with big data. In a McDonald's pilot in Miami, their algorithms sucked in terabytes of data – "weather, time of day, local traffic, nearby events, and historical sales data, both at that specific franchise and around the world" – and spits out personalized recommendations via electronic menus or drive-thru ordering kiosks to drive more sales. "We've never had an issue in this business with a lack of data. It's drawing the insight and the intelligence out of it," said McDonald's CEO Steve Easterbrook. A surprising comment, given McDonald's was the first restaurant to pioneer data-driven kitchen optimization, designing the entire supply chain to minimize costs while still delivering hundreds of billions of delicious burgers. Still, we wonder if this acquisition points to the next weapon in a long-fought war between digital and retail sellers: personalization. E-commerce sites have long relied on personalization to drive sales, selecting between dozens of landing pages and A/B testing thousands of digital advertisements to satisfy your particular interests and maximize the amount you spend. Physical retailers don't have the luxury of copy paste. Each store must serve everybody equally, and store attendants can only update displays and arrangements so frequently. Restaurant menus are even worse, often updated every few months or years at best. Retailers aren't asleep at the wheel. Macy's now collects customer-specific data, tailoring discounts and offers at checkout based on your purchasing history. Ikea now lets anybody trial furniture at home with augmented reality, so you can see exactly what their couches and chairs would look like in your living room. EmCap portfolio company EverSight helps grocery stories dynamically adjust prices to drive sales and maximize revenues for every type of purchase. Google-backed AI startup Mobvoi is raising $100M before their IPO. Uber bought Careem for $3.1B. Apple launched a lot of things, including a credit card. Facebook might have leaked a lot of passwords, but nobody is sure, and two of their executives named Chris are leaving the company. Google was fined €1.49B for violating anti-trust rules. Three AI pioneers won the $1M Turing Award. Pagantis raised a €65M Series B. Workboard raised a $23M Series B. Alibaba acquired InfinityAR. Corporate housing provider Zeus raised $24M. IFTTT doesn't support Gmail anymore. AI is helping prevent preterm births using health data. It feels like strategic investors are popping up everywhere, offering term sheets and the allure of guaranteed customers in exchange for parts of and information about your business. Besides Google and Salesforce, giant Fortune 100 companies are beginning to see the value in venture capital. Mitsubishi, Intel, Qualcomm, Comcast, Samsung, Dell, CitiBank, Cisco, J&J – even Starbucks is getting into the game with a $100M contribution to a food and retail growth equity firm. Know what you're signing up for. While the benefits of a large corporate partner can be obvious – warm customer leads, a big logo for your landing page, and a natural acquirer down the line – the downsides are often less clear. Dig deep to see if your strategic investors are truly invested in your company's long-term financial success. The last thing you want is your investors to pull their ongoing support based on the whims of their corporate bosses. Selling AI products has unique challenges. We sat down with Salesforce Einstein's former marketing lead, Jim Sinai, to get you the best advice on how to sell your AI-powered products. Read more. Massive stakes. Hypercompetitive markets. Easy to get wrong. Doug Landis sat down with Entrepreneur to highlight pitfalls founders can find themselves in when hiring their first sales leader. Read more. We sat down with 4th & King, a pitch design agency behind $1.9B in capital raised. They walk you through exactly how to set your company up for Series A pitch success. Read more. Selling to the Fortune 1000 doesn't have to be difficult. We sat down with Salesloft CRO Sean Murray about the perils and key strategies of beginning to sell to bigger businesses. Read here. There's too much AI buzzword bingo these days. Our very own Jake Saper sat down with Forbes to walk you through how to cut through the AI hyperbole and strike gold. Read more. Doug Landis sat down with podcast host Brian Burns to walk you through the secrets behind customer's buying decisions. Listen here. SF, NY, and LA are running out of engineers. Rocket past your competitors by leveraging global talent, with detailed strategies compiled from our very own Joe Floyd. Read more. Proud to see Openpath featured in Forbes. Keycards should be a thing of the past, and we're excited to partner with the Openpath team as streamline office access for everyone. Read more. Supporting high-growth SaaS startups is difficult. Learn the top five strategies from Stack Overflow's Jerry Raphael, Vista's Mark Ralls, White Ops's Vera Nazarova, and more. Sign up. Our very own Doug Landis, the Bridge Group's Trish Bertuzzi, ActiveCampaign's Adam Johnson, and 10+ more are talking all things SaaS sales. Sign up. Senior Data Scientist – Venture capital isn't right for every company. Clearbanc funds scaling e-commerce companies with the growth capital they need. They're hiring a senior Data Scientist with 4+ years of experience, based in Toronto. Apply here. Chief Marketing Officer – Openpath is killing the keycard, fixing access control for us all. They're hiring a CMO to help tell their story to the world and drive global sales. Apply here. Head of Product – Crunchbase is democratizing access to the world's best startups. They're hiring a Head of Product in San Francisco to help build the next generation of their data analysis and tracking products loved by millions. Apply here. A fitting parable for the state of self-driving cars. Rest in peace, little robot, your ancestors will avenge your death. Watch here. Google's collaborative writing tool has turned into the easiest way to pass notes in class. “I had one really good friend, and we were in different homerooms. So we’d email each other a doc and would just chat about whatever was going on.” Read more. What if Instead of Taking the SAT, You Played a Video Game? A new LA-based startup is hoping to replace the SAT and ACT with a video game designed to assess critical thinking. Read more.